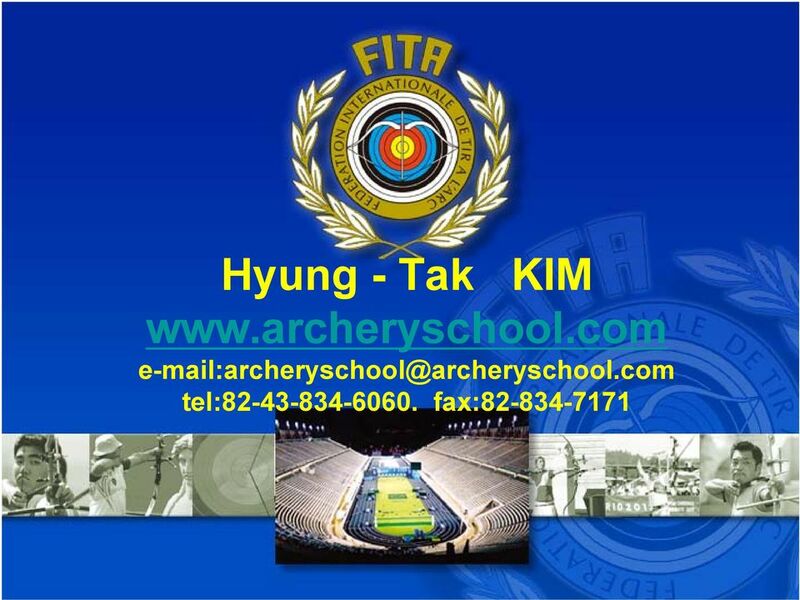 Download "Hyung - Tak KIM www.archeryschool.com e-mail:archeryschool@archeryschool.com tel:82-43-834-6060. fax:82-834-7171"
7 The case of success story of Chinese Taipei team. 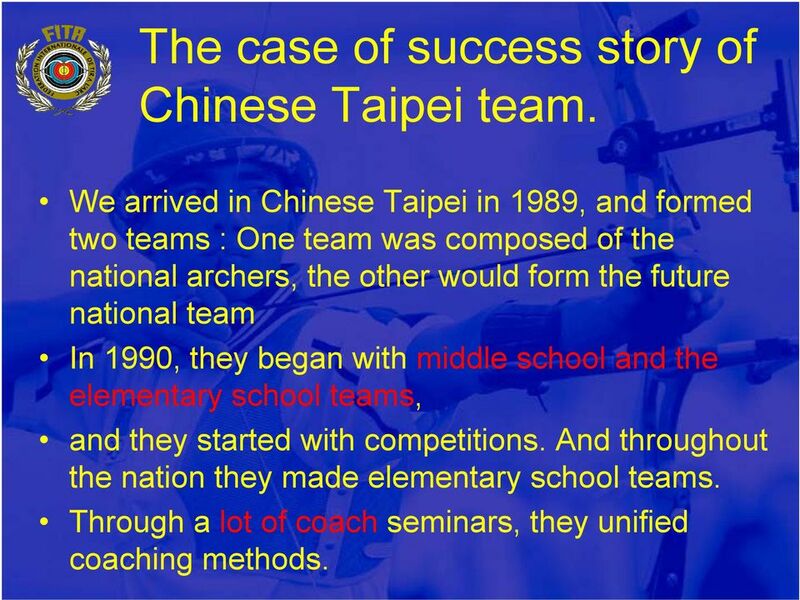 We arrived in Chinese Taipei in 1989, and formed two teams : One team was composed of the national archers, the other would form the future national team In 1990, they began with middle school and the elementary school teams, and they started with competitions. And throughout the nation they made elementary school teams. 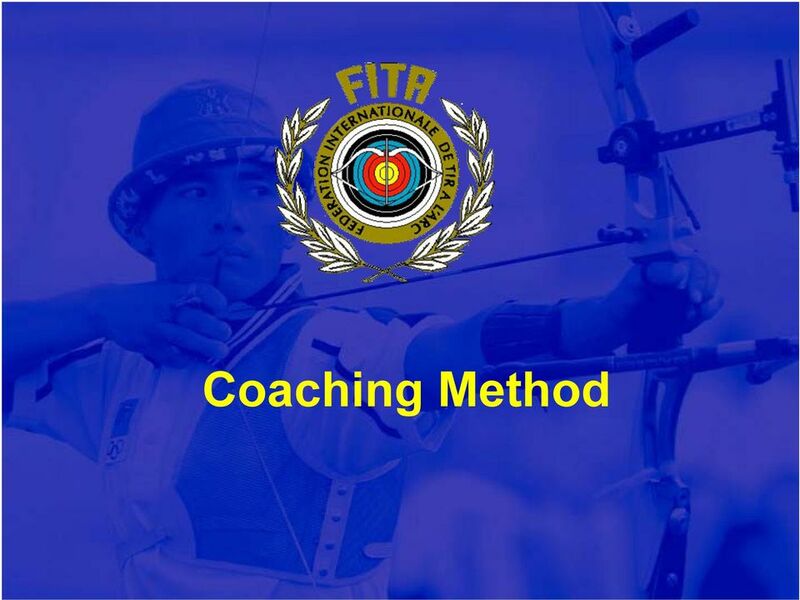 Through a lot of coach seminars, they unified coaching methods. 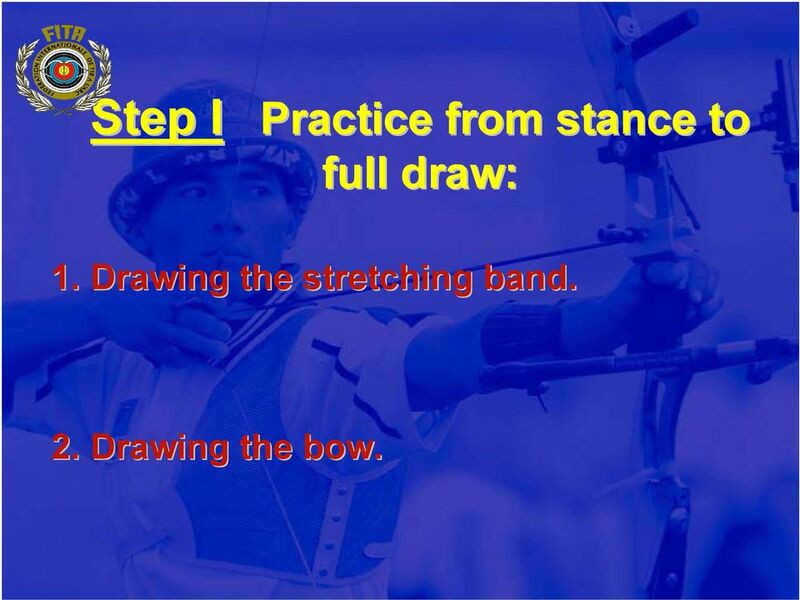 10 Step I Practice from stance to full draw: 1. Drawing the stretching band. 2. Drawing the bow. 11 Step II Pre-training of the release: 1. Finger feeling training release 2. 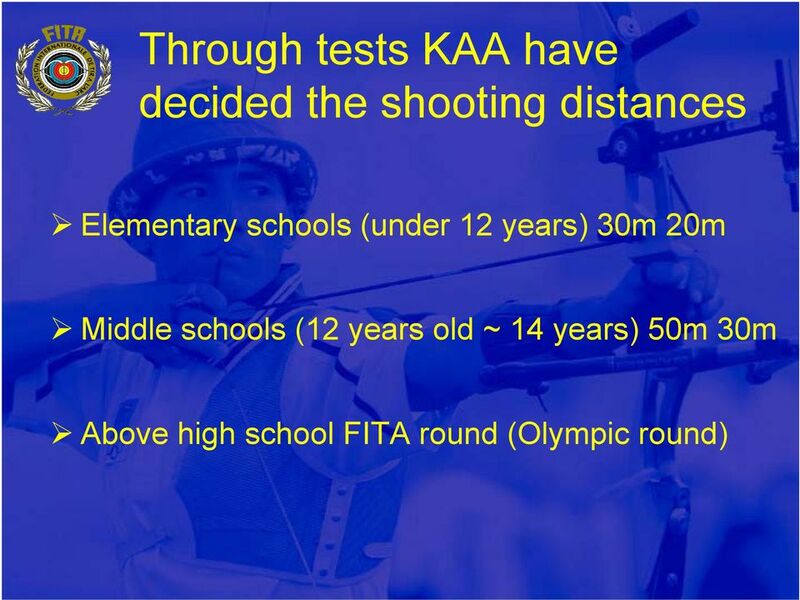 The distance of the release. 3. The direction of the release. 4. The speed of the release. 13 Drawing the stretching band. Stance Set up. The elbow position of drawing arm. The Centre of the body. 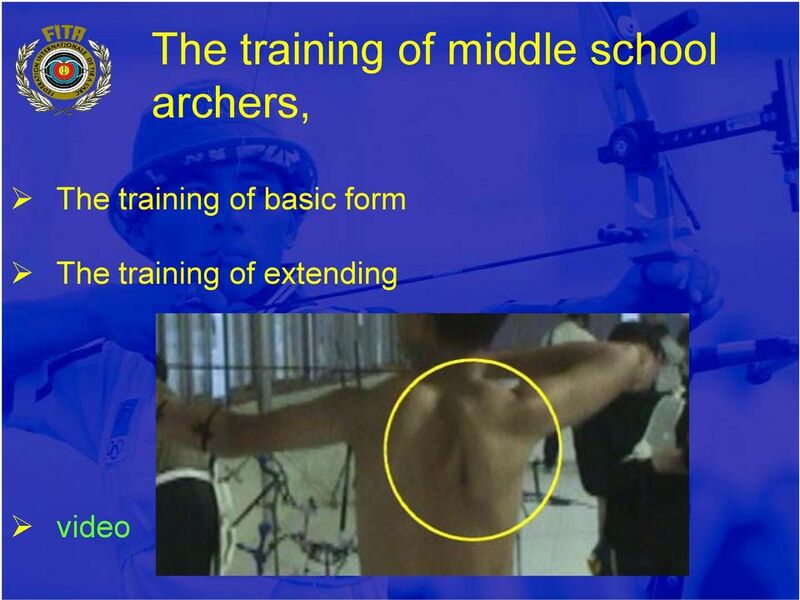 Position of the bow arm shoulder. Position of the head. position of the elbow. 28 Grip Drawing the Bow. The Bow Grip. 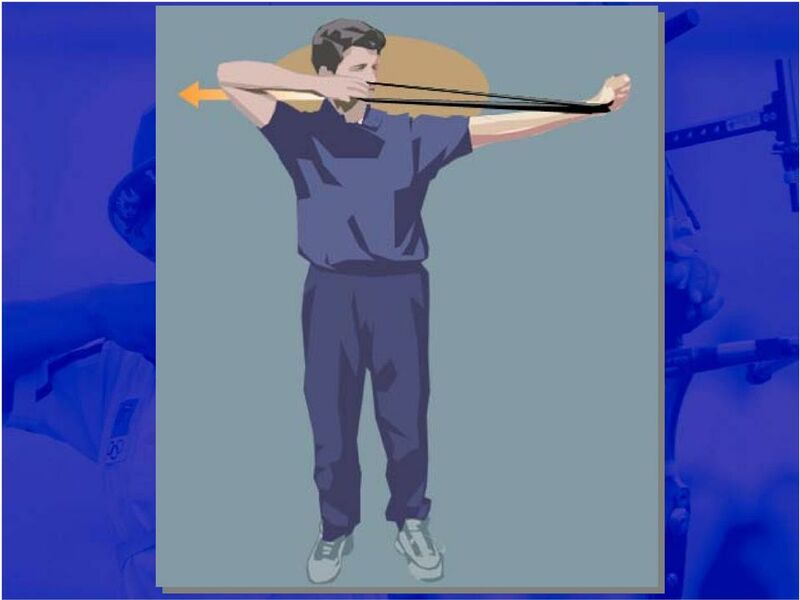 Use the bow sling. 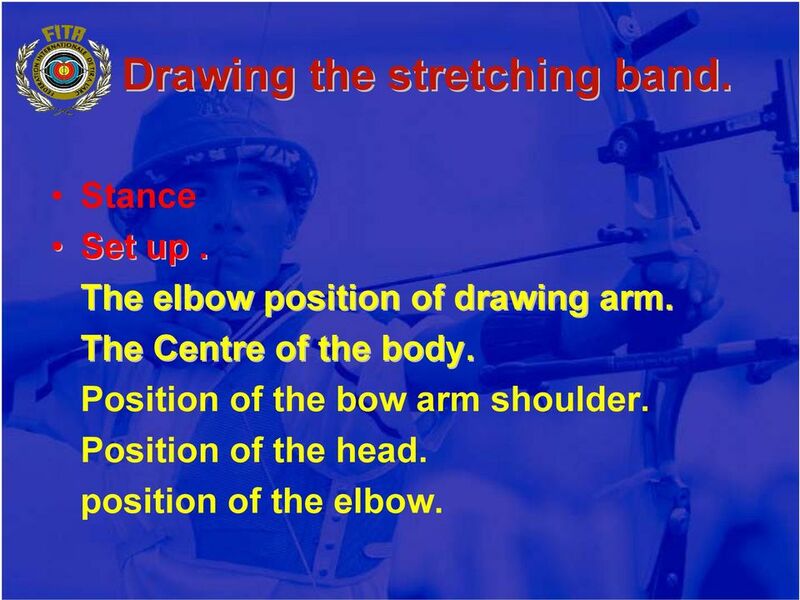 39 The direction of drawing a bow. 59 Use of the Clicker The time to introduce a Clicker When the archers have the ability to draw the bow poundage with ease. 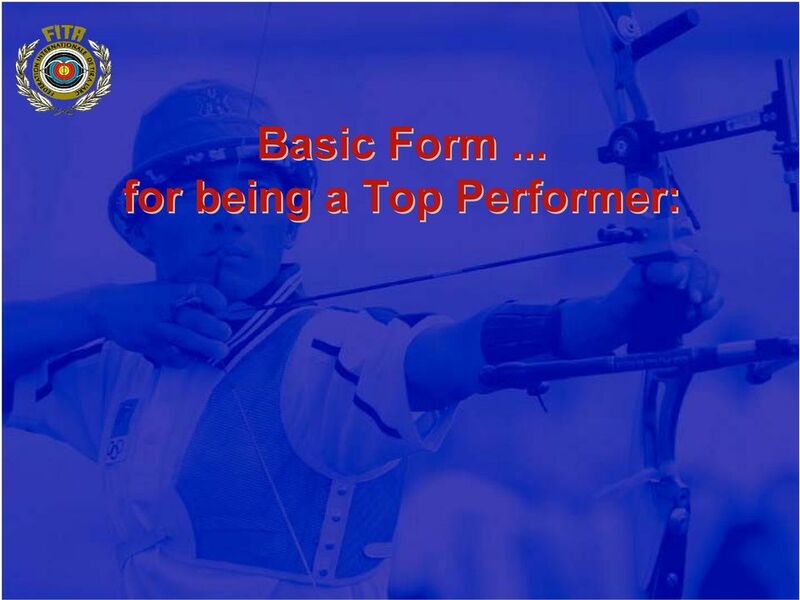 When the archers have mastered a good basic form. Pre-training of the release before introducing the clicker. 61 Use of the Clicker Method, Watching the point STRONG POINTS Always drawn to constant length. 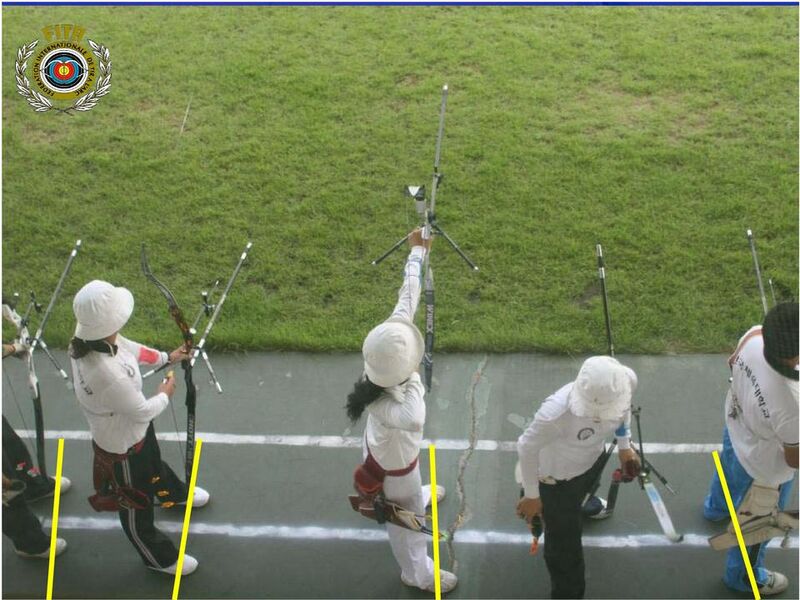 An archer can draw an arrow with a fixed length in spite of the change of the archer s s condition. The drawn length is constant, without any effect of weather change. WEAK POINTS Arrow point moves forward when aiming. 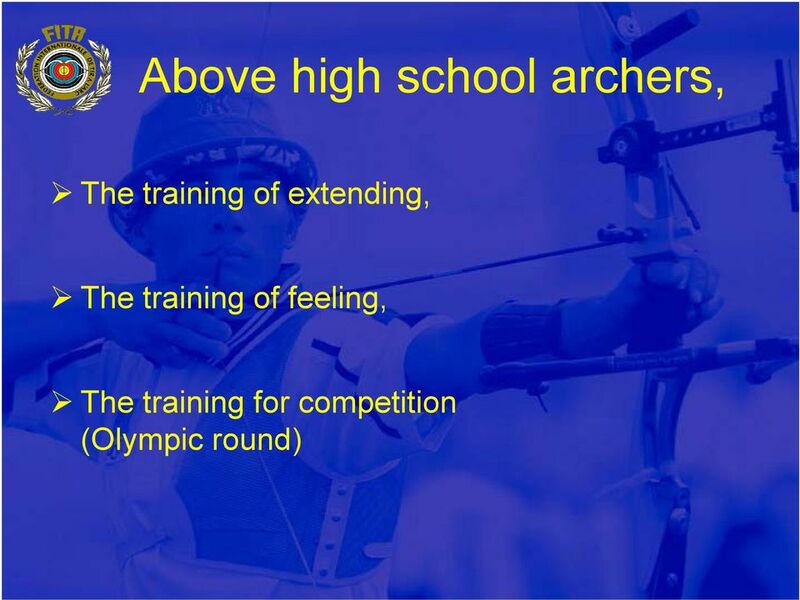 The archer doesn t t extend constantly. Difficult to produce a good extending rhythm. Difficult to make good use of back tension. 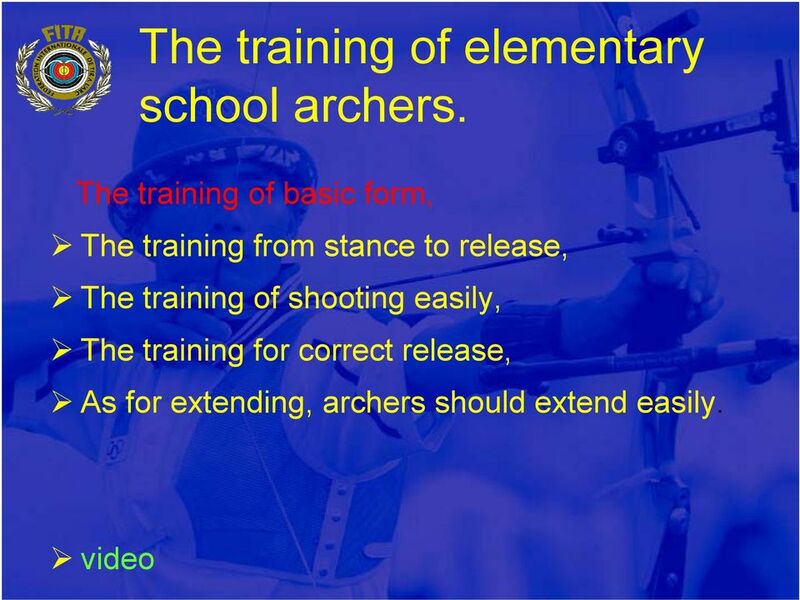 63 Use of the Clicker Not watching the arrow point: STRONG POINTS Extend constantly and smoothly when aiming the target. 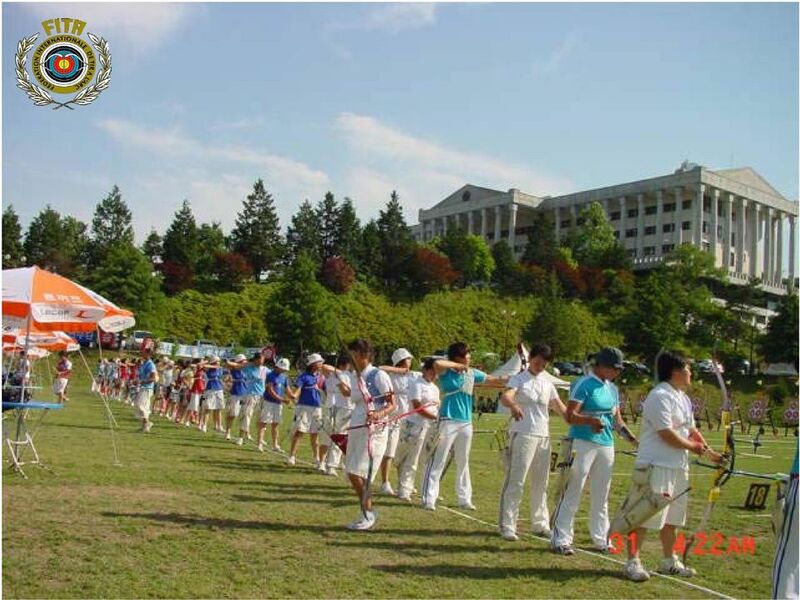 Can maintain a good rhythm. 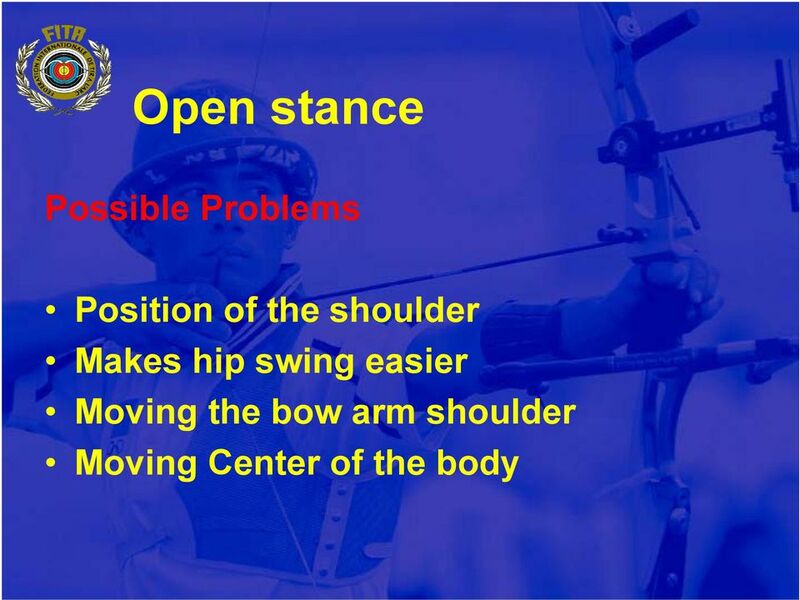 It helps to develop a good extending movement. 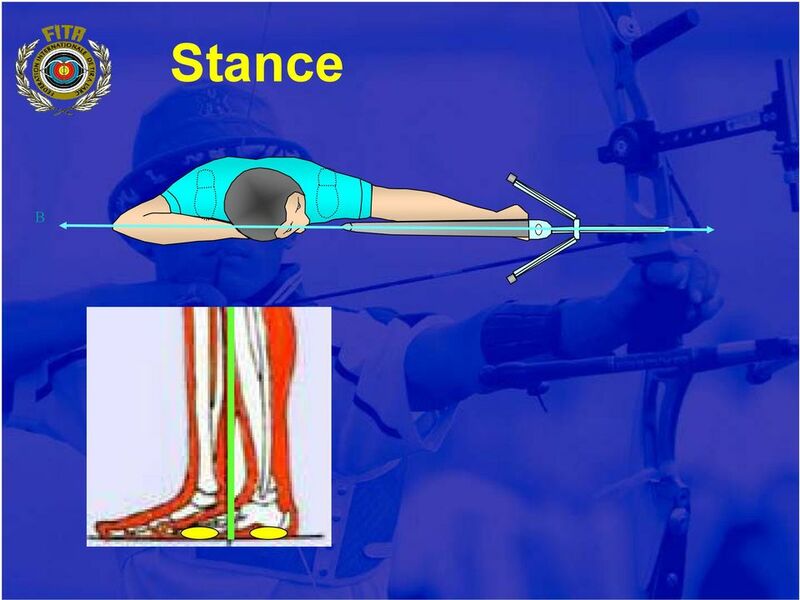 WEAK POINTS It is difficult to produce a constant draw length when archer s s condition is not good enough. Even without any effect of weather change, the drawn length may not be constant. 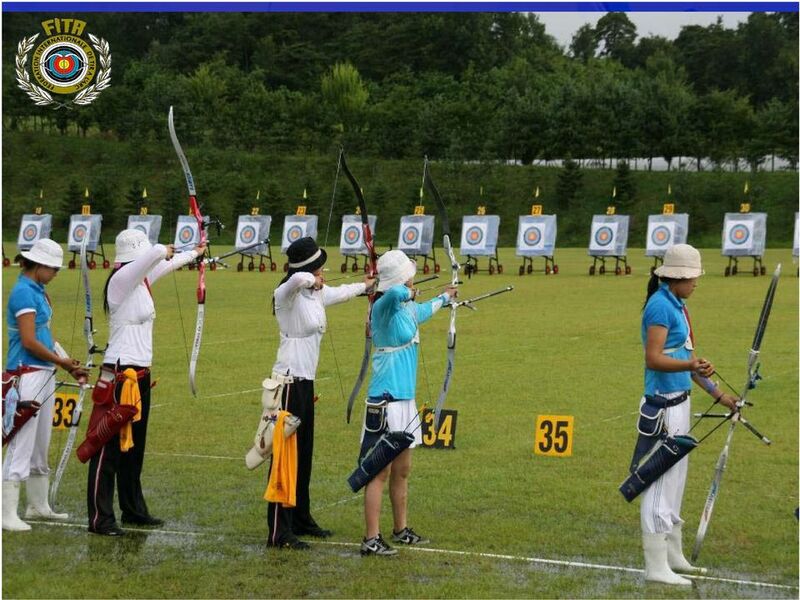 There is a possibility that the archer becomes psychologically uneasy. 64 The method of using the Clicker 1. Watching the arrow point when drawing a bow. 2. 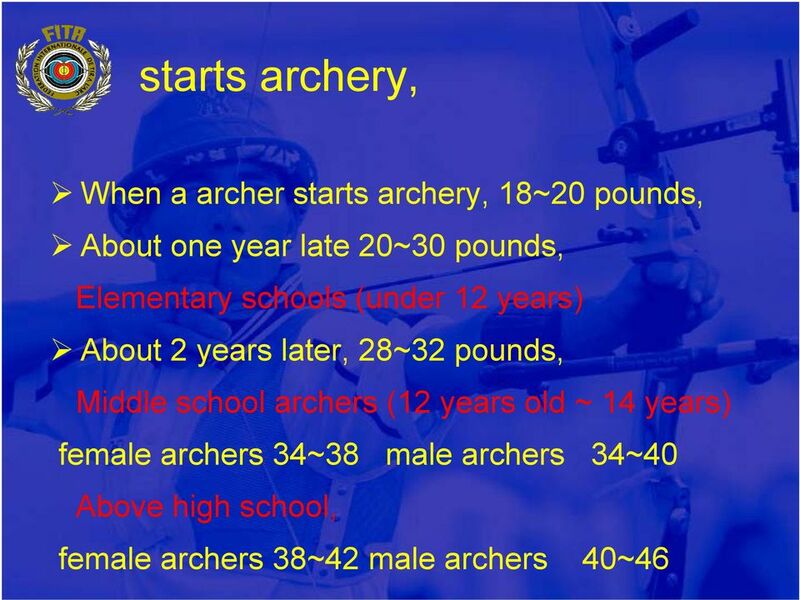 Not to let the arrow move forward when aiming at the target. 3. The forces of both sides should be the same for extending. Extending forces in balance. 4. 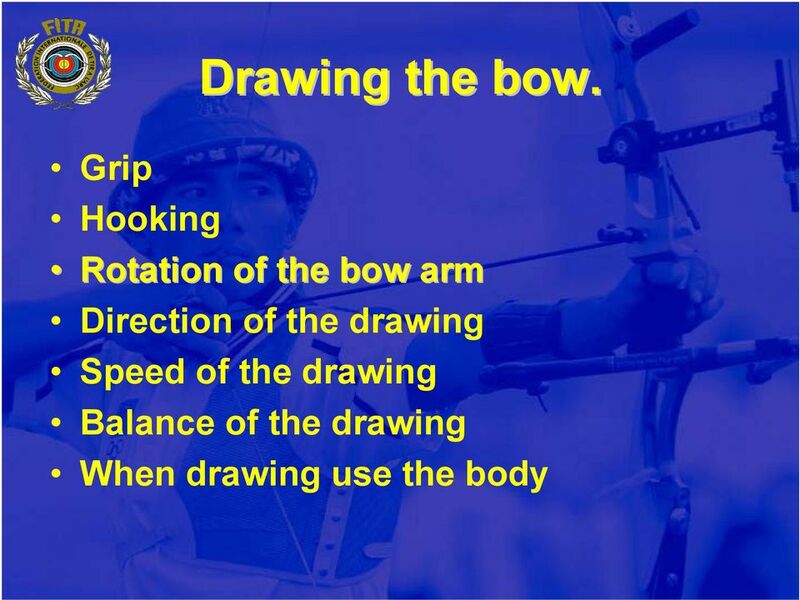 After mastering this, draw without watching arrow point. 5. Get the extending feeling. 6. 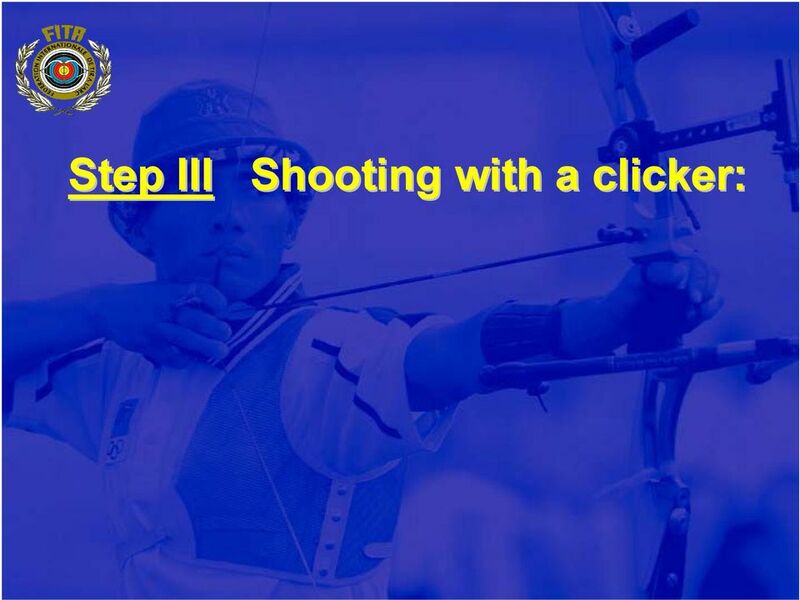 When the point of the arrow is under the clicker, keep the shooting time to less than 3 seconds. 7. Do not shoot with the arrow point forward of the clicker when the clicker has activated. 8. Controlling the timing of extending. 77 Arrow rest? Draw length (over draw)? Raising the chest? Centre of the body? 78 Move the body? Direction of extending? Draw length? Common Injuries in Volleyball. Approximately 50-80% of volleyball injuries occur from overuse Injury Statistics. Real sport for fit men and women!